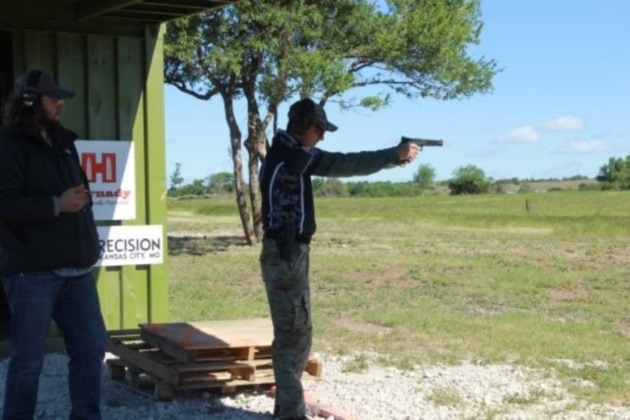 The Glock 17L was a dream to shoot at the Precision Rifle Series Gas Gun Series. Five or so years ago, two of my fellow law enforcement officers and I began our love affair with competitive shooting, specifically 3-gun. Being in law enforcement, we walked a tightrope of trying to keep our “race” equipment as close to our “real-world” equipment as possible while still chasing that last bit of competitive equipment edge. In this pursuit, I built what I would call the “ultimate” Glock to satisfy the best of both worlds and still be competitive in the 3-Gun world. I have previously written about the concept of having “one gun” that would be legal across USPSA Production, IDPA SSP and 3-Gun. That article was about saving money and mastering one pistol. 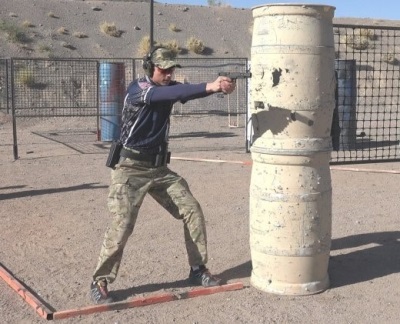 The purpose of this article, though, is to concentrate on building the ultimate Glock for 3-Gun with no cost considerations and the unfortunate side effect of sacrificing legality in IDPA and some USPSA divisions. While this route loses the one gun mentality, it will still be very similar to the Glock 34 I wrote about previously. If you’re after the ultimate Glock 3-Gun pistol or just the ultimate Glock period, this article is for you and I’ll break down my selections step-by-step. A finished Glock 17L, almost too pretty to be shot. I chose the Glock 17L as the ultimate Glock platform to take advantage of the longest possible sight radius Glock has to offer. The 17L was a major competition platform choice before rule changes to slide length by the major competition organizations greatly reduced its demand. Glock has released new batches over the past several years and they are relatively easy to find for a reasonable price. The 9mm platform is perfect for the largest 3-Gun divisions of Tac-Optics and Limited. The 17L could be used in USPSA Limited with the disadvantage of minor power factor scoring but increased magazine capacity and could also be used in Open with some additions such as a 9mm Major compatible barrel, optic and compensator. There are many options in this category and it’s going to be mainly by feel. I personally have mixed parts to create my favorite trigger, which is a hybrid of the McNally Glock Trigger and Zev Tech parts. 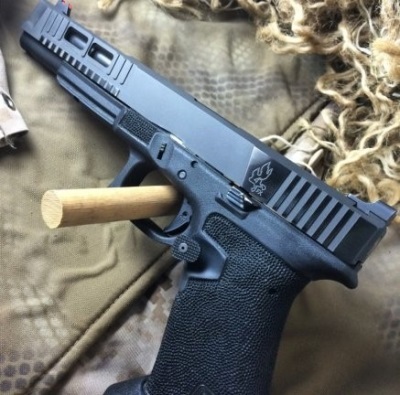 I enjoy the easy-to-adjust without disassembly of the McNally Glock trigger, and combined with a Zev Tech connector, reduced power firing pin spring, firing pin, reduced power safety spring and trigger spring, yields a predictable 2-pound trigger with a “rolling” break. The connector selection will make the biggest difference in feel. Some like the “rolling” break while others like the “wall” type break. Experimenting with different connectors will help you decide on what’s right for you. The reduced-power firing pin spring will also greatly decrease the trigger pull with the sacrifice of possible light primer strikes, which I’ve yet to experience across a wide variety of factory and reloaded ammunition. These parts create a balancing act and really should be done all at once. A light striker spring with the stock recoil spring will produce issues. If you’re going to go this route, it is best to do everything equally that balances the system. With any change, make sure to perform a full safety and function test before firing your weapon. I like the heaviest possible magwell and SJC makes about the heaviest I can find at a massive 8.7 ounces. While I do enjoy the weight it offers, I switched to a Zev Tech heavy brass magwell as it fit my own hand slightly better with only a slight decrease in weight. I would give the SJC a shot first and adjust from there. This is a massive increase in non-reciprocating weight and the single greatest weight addition you can make to your Glock. Zev Tech has discontinued its heavy magwell so my option will vary upon availability. The goal is to increase the non-moving parts weight as much as possible while decreasing the weight of reciprocating parts, such as a slide, which will be addressed at a later point. The long sight radius and low recoil make quick and accurate shots effortless. With the 17L, I opted for an extended tungsten guide rod from the Glock Store. This adds almost one and a half ounces to the gun but unfortunately has been discontinued. A Glock 34 or 35 tungsten guide rod will work if you can’t find the specific 17L extended version. This is a slight increase in weight but every little bit counts. Recoil spring selection is also important and will be based upon the load you shoot. For my own 147 grain loads, I have found the popular 13-pound recoil spring to function perfectly in the 17L as it does in the 34. Having a 13-pound, 11-pound and 15-pound spring to test is a great option and one I did myself. Perform the Glock “battery” test to ensure the slide will close with your chosen spring and prevent the chance of an out of battery ignition. This again is a preference option but I have been using the Warren Tactical Sevigny model fiber optic sights for years and have never had a single issue. The Dawson Precision adjustable sight set is a great option as well if you plan on changing loads or would just like more control over your POI/POA. The Tac Optics and Limited Divisions will cap your magazine length to approximately 141 mm. For my primary magazine to start a stage with, I went heavy again with the Taylor Freelance Brass magazine extensions that add 5 ounces to your gun. This is another great but often overlooked opportunity to add weight in a non-reciprocating area. After the first mag, I opted for a much cheaper option. I went with the Arredondo Accessories extensions due to the great price point and bottom release function versus the frustrating slide on options that seem to be very popular right now. With the easy stuff out of the way, I’ll turn to the changes that once started there is no going back. As someone who is constantly improving on my weapons, whether it be building them from start to finish, changing out parts, fiddling with another part, and then changing it back, I just love the idea of squeezing every last bit of performance out of my gun and making it custom-tailored exactly to me. You can only go so far by changing out springs, triggers or firing pins and when I’ve reached that end I need the help of the professionals. My LEO friends ranted and raved about Fire 4 Effect Weapons Systems of El Paso, Texas, and that I would not be disappointed if I enlisted their expert gunsmithing services. I accepted their advice and set my GPS for their shop. Expecting an industrial store or complex, I was surprised to drive up to what can only be described as my Texas dream ranch complete with shoot house out back. As I exited my vehicle, the biggest dogs I have ever seen in my life greeted me with wagging tails and excitement while their owner followed them in tow. With a dog entourage, I met Will Wingfield, the owner of Fire-4-Effect Weapons Systems and, as it turns out, he was a kindred spirit. Will is a medical professional who has a serious day job but was also bitten with the obsession of competitive shooting. Will actively competes and sponsors shooters in the Precision Rifle Series (PRS) and started his side business due to the competitive love of firearms that has bitten so many of us. While Will gave me a tour of his facilities it became apparent that he is not a knuckle dragger like my friends and I, but is blessed with an engineering, computer-like brain that can immediately figure out and improve on any piece of machinery or technology that you put in front of him. Will personally writes his own CAD designs, runs his own machines, and introduced his own flat-faced Glock trigger. Will patiently showed me the options in grip reduction and slide lightening options he offers. I settled on a “micro-dot” stippling pattern for the grip with safety scalloping and undercutting of the trigger guard for the frame. Next, I selected multiple slide lightening cuts and slide serrations with the “executive” finish featuring glossy and non-glossy finishes. With those selections made, I kissed my beloved project Glock goodbye and waited for what felt like an eternity to anyone that has ever dropped off their pistol to a gunsmith. A few short weeks later my creation showed up at my door. Will spent hours creating a custom CAD design for my Glock 17L. The result was nothing short of a masterpiece in looks and performance. With my new ultimate Glock, at least on paper in hand, I eagerly signed up for a pistol/shotgun match that weekend and ran it through its paces. I was astonished at how much faster I was able to track my sights with the lightened slide, which, in turn, resulted in faster times. The Glock with Taylor Freelance brass magazine basepad is coming in at a heavy 38.4 ounces. This is getting into the all-metal gun territory and really helped to keep recoil at a minimum. The grip reshaping and magazine safety beveling also allowed me to release magazines without changing my pistol grip. My squad had several of the top three gun shooters in the country for the match and I turned in a very respectable performance with several compliments on my pistol shooting speed with the new platform, along with a few jealous looks. As pretty as my new Glock 17L looks, it does not make me a better shooter. In reality, it probably only masks the many deficiencies I work on improving each week at the range. While there are other shooting platforms I love, there is something about a Glock that I just can’t resist and this labor of love will be with me for as long as I’m around. The people at Glock may have thought they created “perfection” but I think I can give them a run for their money with my own improvements.